Pharmaceutical giant Novartis has agreed a deal with Google to develop its "smart" contact lens to help diabetics monitor their glucose levels. 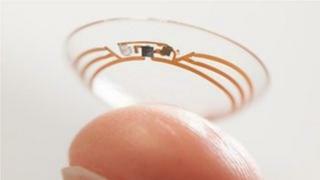 Google's prototype lens was first revealed in January. It is designed to measure the level of glucose in the wearer's tears and communicate the information to a mobile phone or computer. Wearable technology is seen as a key growth sector, with several companies targeting healthcare applications. The lens uses a tiny wireless chip and miniaturised glucose sensors embedded between two layers of soft contact lens material. Google said the chips and sensors are "so small they look like bits of glitter, and an antenna thinner than a human hair". It said the prototype could "generate a reading once per second". The technology had "the potential to transform eye care", Novartis said in a statement. "This is a key step for us to go beyond the confines of traditional disease management, starting with the eye," said the company's chief executive Joe Jimenez. Sergey Brin, co-founder of Google said: "Our dream is to use the latest technology in the miniaturisation of electronics to help improve the quality of life for millions of people." It could take some time before any such device would be ready to sell. "This would be a regulated device, so the same testing would be required as other health-related monitoring devices," says Shane Walker, an analyst at IHS. "What could potentially ease entry is the fact that this device would not be invasive." People suffering from diabetes need to monitor their glucose levels regularly as sudden spikes or drops are dangerous. At present, the majority of them do so by testing drops of blood. Consumer demand for innovative ways of doing this is likely to grow as the incidence of diabetes continues to increase, experts say. According to the International Diabetes Federation, one in ten people across the world's population are forecast to have diabetes by 2035. The companies have also suggested a further application of the technology could lie in restoring the eye's ability to autofocus, relieving the need for reading glasses.